Cultural resources may be cherished for their beauty or utility or a host of other reasons. But it is the ability to connect one generation to another that gives them their most valued attribute: an inherent capacity to mold and reinforce our identities as social creatures. Of course, the shaping and guiding of human lives involves much more than cultural resources; it embraces the entire cultural system into which each person is born and within which each must grow and work, love and die. Cultural resources are both a part of and representative of these systems. In concert with lesson plan and sacred ritual, recreational play and family vacation, cultural resources bring people together with the values and ideas that are necessary for success in contemporary society. Cultural resources constitute a unique medium through which all people, regardless of background, can see themselves and the rest of the world from a new point of view. Access to cultural resources means that people can learn not only about their own immediate ancestors but about other traditions as well. New citizens can discover for themselves how earlier immigrants became Americans; descendants of African, Asian, and European ancestors can discover unexpected commonalities; and all of us can come to better appreciate the great saga of Native American history. Such an exchange offers every American a place of importance in the history of our country as well as an opportunity to meet others and be met in a spirit of mutual tolerance, appreciation, and respect. A primary responsibility of the National Park Service is to identify, protect, and share the cultural resources under its jurisdiction. The work inherent in this endeavor is varied and challenging. First, there must be systematic, open-minded study by archeologists, historians, and other specialists to locate resources and to discover or substantiate their significance. Second, considerable thought must be given to the problem of simultaneously protecting park resources and making them available to the public. Third, appropriate treatment programs and protective measures must be put into effect. This chapter will provide an overview of these management activities and explore the nature of cultural resources. Much of the discussion is focused on the physical aspects of resources: on the empirical link between the substance of a resource and its historical or ethnographic associations, on threats that could cause a resource to degrade or deteriorate, on defining and allowing appropriate use and enjoyment of the resource. Important as these issues are, they are but support for a larger concern: to enhance individual lives within the framework of a culturally diverse American society. As such, cultural resources are not valuable in and of themselves; they are to be treasured for the connections they provide between people and cultural traditions, between people and the world at large. American history is well represented in the national park system. Although political and military themes have predominated, the parks' historical associations range from aboriginal settlement of the Western Hemisphere to the initiation of powered flight; they stretch from European exploration of the New World to the struggle for voting rights; they encompass the serenity of a poet's garden and the sweeping grandeur of a ridgetop parkway. Many park resources are the physical remains of this heritage. They are clay pots buried deep in the earth and brick forts guarding harbor entrances, quill-penned script on yellow parchment and smoke-belching locomotives, fragrant gardens and streets lined with tall wooden houses. These resources are unmistakable evidence of earlier livesa common inheritance from past generations with whom we have shared this land. The National Park Service is also steward of places, objects, and records important in perpetuating specific ethnic traditions. Such resources include vision quest sites and evangelical churches, feathered headdresses and hand-forged farm tools, oral histories and salmon-filled rivers. When used by their associated ethnic groups, these types of resources help underpin entire cultural systems. Resource management sensitive to the rights and interests of these groups, especially Native Americans, can help perpetuate if not strengthen traditional activities such as subsistence, language use, religious practice, and aesthetic expression. In this context, cultural resource management extends beyond concern with tangible resources to recognition and accommodation of cultural processes. This connection between parks and cultural resources is well established in federal law. The act of 1916 by which Congress created the National Park Service clearly mandated the bureau to allow for public enjoyment of cultural resources while ensuring their protection. Over the years the federal government has enhanced and supported this role through repeated affirmation that cultural resources are a matter of national interest. Building on the 1906 Antiquities Act and the Historic Sites Act of 1935, this message was clearly spelled out in the National Historic Preservation Act of 1966 and its amendments, it was reiterated in the Archaeological Resources Protection Act of 1979, and it was reinforced by the Native American Graves Protection and Repatriation Act of 1990. Although each of these acts has its own focus and orientation, collectively they require a comprehensive, multicultural approach to managing cultural resources in national parks. The physical attributes of cultural resources are, with few exceptions, nonrenewable. Once the historic fabric of a monument is gone, nothing can bring back its authenticity; once the objects in an archeological site are disturbed, nothing can recover the information that might have been gained through analysis of their spatial relationships. The primary concern of cultural resource management, therefore, is to minimize the loss or degradation of culturally significant material. Closely related issues include compatibility between cultural resources and new development; consideration of visitor needs, especially those of special populations; incorporation of sustainable design principles in resource protection strategies; and support for the interpretation of park resources, both natural and cultural. Straightforward as these concerns are, translating them into a management program is anything but simple. Contributing to this complexity are a legally mandated review process, staff trained in diverse academic disciplines, limited funds, and a shortage of trained personnel. In spite of these conditions, cultural resource management can be largely understood in terms of three basic questions that must be asked about all cultural resources. How is a cultural resource identified and what makes a resource significant? What should be done to properly care for a cultural resource? How do cultural resources fit into the overall scheme of park management? In the past, these questions have usually been answered in the context of specific academic disciplines, such as architecture or museology. But when park managers and cultural resource specialists talk about cultural resource issues or when NPS staff meet with state historic preservation officers, their discussions would undoubtedly benefit from a common understanding of the program as a whole. The discussion in this chapter provides such an overview by linking cultural resource management with park operations and by presenting the full range of cultural resources in terms of their common denominators. The National Historic Preservation Act recognizes five property types: districts, sites, buildings, structures, and objects. As called for in the act, these categories are used in the National Register of Historic Places, the preeminent reference for properties worthy of preservation in the United States. To focus attention on management requirements within these property types, the NPS Management Policies categorizes cultural resources as archeological resources, cultural landscapes, structures, museum objects, and ethnographic resources. Resource categories are useful because they help organize cultural resources into a manageable number of groups based on common attributes. On the other hand, categorization may obscure the interdisciplinary nature of many cultural resources. An early farmhouse, for example, may be filled with 19th-century furniture, form the centerpiece of a vernacular landscape, and occupy the site of a prehistoric burial mound. In addition to this type of overlap, cultural resources might also embrace more than one category or classification system. A stone ax can be both an archeological resource and a museum object, just as a fence may be viewed as a discrete structure, the extension of a building, and part of a landscape. Taken a step further, historic districts can be formed by various combinations of cultural landscapes, structures, and ethnographic and archeological resources. Archeological resources are the remains of past human activity and records documenting the scientific analysis of these remains. Archeological resources include stratified layers of household debris and the weathered pages of a field notebook, laboratory records of pollen analysis and museum cases of polychrome pottery. Archeological features are typically buried but may extend above ground; they are commonly associated with prehistoric peoples but may be products of more contemporary society. What matters most about an archeological resource is its potential to describe and explain human behavior. Archeological resources have shed light on family organization and dietary patterns, they have helped us understand the spread of ideas over time and the development of settlements from place to place. Cultural landscapes are settings we have created in the natural world. They reveal fundamental ties between people and the landties based on our need to grow food, give form to our settlements, meet requirements for recreation, and find suitable places to bury our dead. Landscapes are intertwined patterns of things both natural and constructed: plants and fences, watercourses and buildings. They range from formal gardens to cattle ranches, from cemeteries and pilgrimage routes to village squares. They are special places: expressions of human manipulation and adaptation of the land. Structures are material assemblies that extend the limits of human capability. Without them we are restricted to temperate climates, the distances we can walk, and the loads we can carry. With them we can live where we choose, cross the continent in hours, and hurl a spacecraft at the moon. Structures are buildings that keep us warm in winter's worst blizzard and bridges that keep us safe over raging rivers; they are locomotives that carry us over vast prairies and monuments to extend our memories. They are temple mounds and fishing vessels, auto factories and bronze statueselaborations of our productive ability and artistic sensitivity. Museum objects are manifestations and records of behavior and ideas that span the breadth of human experience and depth of natural history. They are evidence of technical development and scientific observation, of personal expression and curiosity about the past, of common enterprise and daily habits. Museum objects range from a butterfly collection to the woven fragments of a prehistoric sandal. They include the walking cane of an American president, a blacksmith's tools, and the field notes of a marine biologist. They encompass fossilized dinosaur bones and business journals, household furnishings and love letters bound with a faded ribbon. They are invaluablesamples and fragments of the world through time and the multitude of life therein. Ethnographic resources are basic expressions of human culture and the basis for continuity of cultural systems. A cultural system encompasses both the tangible and the intangible. It includes traditional arts and native languages, religious beliefs and subsistence activities. Some of these traditions are supported by ethnographic resources: special places in the natural world, structures with historic associations, and natural materials. An ethnographic resource might be a riverbank used as a Pueblo ceremonial site or a schoolhouse associated with Hispanic education, sea grass needed to make baskets in an African-American tradition or a 19th-century sample of carved ivory from Alaska. Management of ethnographic resources acknowledges that culturally diverse groups have their own ways of viewing the world and a right to maintain their traditions. An idea common to all cultural resources is the concept of significance. To be significant, a cultural resource must have important historical, cultural, scientific, or technological associations and it must manifest those associations in its physical substance. Put another way, the significance of cultural resources is based on two interrelated qualities. A cultural resource consists of a number of physical, chemical, or biological features; at the same time, it consists of ideas, events, and relationships. This duality is evident in cultural resources as small as a penny or as large as the Statue of Liberty. Fashioned from copper, both share common material properties. Shaped into symbolsone of economic value, the other of a fundamental human rightboth also serve as expressions of ideas. The physical and social dimensions of a cultural resource are inseparably interwoven. For a resource to be significant, its meaning must be indelibly fixed in form and fabric. The flag on Abraham Lincoln's box at Ford's Theatre epitomizes this relationship. Immediately after shooting the president, John Wilkes Booth jumped to the stage, catching his spur in a flag hung in front of the box. The material ripped, and so it remainsa small detail in the story of Lincoln's life, but tangible evidence of the horror of his death. Regardless of type, every cultural resource must have a place in the history or prehistory of the United States, or it must have value for a particular ethnic group. This tie between a resource and its cultural context is its association. Associations commonly fall into one of four areas. Resources may be linked to historic events or noteworthy people; they may be embodiments of technical accomplishment, design, or workmanship; they may be sources of information important in historical or archeological research; or they may be important in the cultural system of an ethnic group. The context for these associations may be national in scale or focus on regional and local affairs. Associations tie the rustic hotels of Yellowstone to the great craft revival of the early 20th century. They fix Casa Grande in a prehistoric network of desert canals, trade routes, and migration patterns. They frame the remains of Andersonville Prison in rules of honorable conduct that were shattered by the Civil War and relate the Blue Ridge Parkway to the development of an automobile-oriented society. Associations are integral to the significance of cultural resources because they define why each resource should be preserved and, by extension, what characteristics of each resource are most important. Time provides a vantage point from which the associations of a cultural resource can be assessed in the broad course of human experience. Time is important as well because it provides a frame of reference for specific associations. A battlefield is important for the time in which the battle was foughtand perhaps also for what it reveals about later commemorative attitudes and practices. Although the home of a president is significant for the time of his occupancy, it might also be noteworthy for other distinguished occupants, for its architectural style or landscape setting. A resource may have more than one period of significance because it has more than one association, but every association must have a defined point or period in time. As mentioned earlier, ethnographic resources are not limited to things commonly thought of as cultural resources, nor are ethnographic associations limited to past people and events. For ethnographic resources, associations are links to living traditions. For example, in ethnographic terms a grove of trees or a distant mountain peak might be considered worthy of preservation for social or religious associations when tied to the ongoing cultural practices and beliefs of a specific ethnic group. An archeological site significant for its scientific value may also be an ethnographic resource for its place in the mythology of a nearby pueblo. Although a cultural resource must have relevant associations, a cultural resource does not consist solely of those associations. In themselves, cultural resources are not a revolutionary engineering concept or a pattern of crop rotation, a landmark court case or the skills of a master craftsman. Cultural resources are physical entities with qualities such as mass, color, and texture, some of which express historical or cultural associations. Integrity addresses the degree to which behavior and ideas are manifested in the form and substance of a resource. A cultural resource has integrity if it retains material attributes associated with its social values. Integrity has many attributes. It is the material aspect of a resource and the ways in which materials were put together; it is the relationship between different parts of a resource and the aesthetic qualities that resulted; it is the exact geographic location of a resource and the nature of its setting. Integrity may be hidden under coats of paint, aged by weather, or chipped away by rodents; but it is capable of being sensedit can be recognized, described, and verified. Integrity is the past revealed in physical form. Although all cultural resources must have integrity, the nature of integrity varies from resource to resource. For a noteworthy landscape, integrity may be a matter of spatial organization, plant types, and paving materials. In a writer's study, integrity may be found in the mementos and books displayed on a shelf or in the contents of a desk drawer. Buried remains of towns and villages retain integrity in the association between potsherds and pollen deposits, post holes and parched corn. For an architectural masterpiece, the quality of design is essential; for a traditional building type, workmanship may be most important. Integrity is not the same as condition. The condition of a resource is defined in terms of deterioration; integrity is defined in terms of correspondence with associations in the past. Condition is a matter of rot and rust; integrity is a matter of age and authenticity. All physical things have a condition; they do not all have historical integrity. On the other hand, all things with historical integrity also have a condition. The condition of a resource during its period of significance is part of its integrity. The dual nature of cultural resources, an inseparable union of social and physical qualities, leads directly to the three central issues of their management: first, to discover the significance or meaning of each resource; second, to slow the rate at which their essential material qualities are lost; and third, to support the use and enjoyment of cultural resources while minimizing negative effects on them. These imperatives are at the heart of the cultural resource program. Their corresponding activities are emphasized differently for each resource type and labeled differently from discipline to discipline. But we can discuss the sum of all these activities in terms of three broad functions: research, planning, and stewardship. Research begins by locating and evaluating cultural resources. It entails historical analysis and detailed physical examination. Research identifies Native American groups with traditional interests in park resources and locates places or things within park boundaries having special importance for them. It works through layers of debris in a coastal village site, discovering how people once lived from the proximity of fish bones, shell beads, and other things left behind. Research has the potential to identify changes in the field layout of a farming valley, establish the load-bearing capability of a building, and verify the origin of a historical document. A major issue in research is setting appropriate limits on the scope and level of investigation. In most cases, NPS policy requires that research be driven by management concerns. Defining management concerns and translating them into a research activity requires dialogue between managers and cultural resource specialists. Research should also consider ideas and advice from people outside the Serviceparticularly our partners in cultural resource management, contemporary ethnic populations, historians, and scientists in related fields. This exchange should grow from a shared understanding about the nature of cultural resources, it should reflect awareness that treatment without adequate information may do more harm than good, and it should not presume that research is an end in itself. Planning addresses the basic question, "How can we best take care of our resources while allowing the public to enjoy them?" Good answers to this question require creative thinking, insightful analysis, and well-tempered flexibility. Planning seeks to identify and assess the likely effects of an action on cultural resources before that action is taken. Planning also recognizes the validity of different cultural perspectives and finds ways to integrate those viewpoints with park management objectives. Planning looks not just at desired results, but also at the potential for unintended harm. Putting a 19th-century quilt on display may help tell a story about American craft traditions, but it may also increase the possibility of the quilt being soiled, mutilated, or stolen. Planning weighs the tradeoffs between preservation and functional considerations in finding uses that best fit a specific resource. Although inappropriate uses can have devastating effects on cultural resources, protective treatments may themselves give cause for concern. Use of herbicides to control vegetation in an archeological site may prevent damage from roots, but might also invalidate Carbon-14 dating of material recovered from that site. Application of some latex paints may reduce maintenance costs for historic woodwork, but might also result in surface loss from water vapor trapped under the new coating. Similar problems have been encountered with abrasive cleaners, metal reinforcing rods, and mothballs. Slowly, constantly, at the scale of pinholes and hairline cracks, these threats can bring down the largest of structures and reduce the hardest stone to dust. 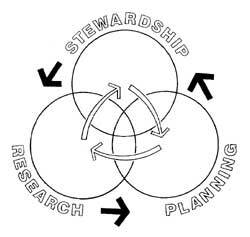 Research and planning culminate in stewardship. Stewardship consists of systematic, responsible actions directly affecting resources. Stewardship is a matter of matching ability with the task at hand. Watering a lawn, dusting furniture, and oiling door hinges are common acts of stewardship. So too are pruning a tree and replacing a worn stair treadalthough this work requires a higher level of knowledge and ability. Even more skill is needed to repair fragile materials such as frescos in a Spanish Colonial church, to propagate historic plant material embodied in a rare fruit tree cultivar, or to recover data from a prehistoric hunting camp. Stewardship seeks to limit the loss of historic materials and to maintain historic character; it results in the perpetuation and appreciation of cultural values. Most of the threats to cultural resources come from their surroundings. Theft, uncontrolled relative humidity, and careless handling endanger museum objects. Looting, soil erosion, and rodents eat away at archeological resources. Acid rain, fire, and remodeling pose serious threats to historic structures. Wildland fires, highway improvements, and plant diseases wreak havoc with cultural landscapes. Fencing, pollution, and insensitive use can desecrate an ethnographic resource. Responses to these threats are many and varied. They range from police stakeouts to improved record-keeping, from installation of smoke alarms to structural monitoring gauges. But the two most important and effective protective measures cannot be seen. The first is a positive, caring attitude toward cultural resources. Coupled with knowledge, such an attitude prepares every employee to act as a resource stewardrecognizing threats, taking appropriate emergency action, and calling for assistance. The second measure is a spirit of cooperation that reaches out to form stewardship coalitions with local governments, professional organizations, state agencies, and nonprofit groups. Such partnerships are essential to confronting threats located outside park boundaries; they are also supportive of more comprehensive approaches to resource identification, planning, and heritage education. Research, planning, and stewardship: these are the basic functions of cultural resource management. Taken as a sequence, they proceed from information gathering to thoughtful deliberation to informed action. To the extent that stewardship is a final step, management of cultural resources is a linear process. The process is also cyclic because every act of stewardship creates new conditions that should be recorded as part of the park information base. In addition, the program contains feedback loops that allow each management function to refer back to the preceding set of activities. If a planning option requires information that is currently unavailable, more research can be done. If treatment of a resource uncovers previously unknown features, work can be reevaluated and earlier planning decisions can be revised as necessary. Implementation of a cultural resource program is a matter of concerted individual effort. People, not programs, are resource stewards. Superintendents and cultural resource specialists certainly play critical roles. So, too, do the carpentry helper, park ranger, and budget clerkin fact, every person working in a park is a steward to the extent that his or her actions affect cultural resources. Those working in NPS centers and support offices are also part of the stewardship team. Beyond them are employees in state historic preservation offices, people working in other government agencies, educators, tribal representatives, business people, and interested private citizens. Effective stewardship requires that people work together whenever a cultural resource could be affected by their actions. For example, protection of a prehistoric burial site might involve the joint effort of a park superintendent, Native American representatives, a soils engineer, a physical anthropologist, and a contract specialist. Protection of a historic building interior might bring together a historian, paint conservator, structural engineer, mechanical contractor, architect, and curator. Teamwork is essential because, in most cases, no one person fully knows the nature of a specific resource, the reasons behind a particular project, or the full range of implementation alternatives. The challenge inherent in cultural resource management is that each resource is only one of many concerns clamoring for attention in a park. A historic lodge may need a new roof at the same time that the museum collection needs to be cataloged, bathrooms need to be cleaned, lawns need to be cut, and roads need to be patrolled. What principles might illuminate the choices between such options? A good first principle is that appreciation of a resource lies outside of contemporary concerns. Law and policy require that we understand and evaluate each resource in the context of its own time and its own culture. Such an approach is well established in terms of survey and evaluation procedures. It applies equally well to identification of physical attributes deserving preservation and conditions that threaten to degrade or destroy a resource. Significance, integrity, and threats should be well understood before attention is turned to matters of maintenance, security, staffing, and use. A second principle is that decisions should recognize variations in meaning, integrity, and threats. Every cultural resource, no matter how humble or how widely valued, must be addressed in the park resource management program. But when funds and labor are insufficient to meet the needs of all resources, differences should be acknowledged. For example, the home of a president is typically of greater interest to more people than the residence of a state governor; an example of skilled workmanship, such as a finely crafted mantlepiece, usually contributes more to the historical integrity of a house than do the unfinished walls of a basement; rapid change in relative humidity is far more likely to harm a table with wood veneer than it is to break down a basalt grinding stone. Decision points should take advantage of these variations to provide greater protection to more significant fabric, mitigate more serious threats, and give higher attention to more noteworthy resources. Third, and finally, cultural resource management must be integrated with natural resource management, education, and visitor experience as the primary concerns of park management. An integrated approach builds on the fundamental relationships among physical, biological, and social systems; it views human beings as part of the natural world and the natural world as the basis for human activity. This is not to say that other issues and other federal mandates are unimportant. Rather, it is a recognition of the National Park Service's mission and its leadership role in resource management. In summary, effective decisions begin by recognizing the unique attributes of a cultural resource and expand out to encompass the full range of contemporary concerns. Practical utility, aesthetic appeal, political implications, and replacement costs usually have nothing to do with significance. On the other hand, such considerations may help move a locally significant resource into next year's work schedule. Resource-specific variability and timely consideration of practical issuesthese are cornerstones for decisions made in the spirit of stewardship. The cultural environment is the nursery in which each generation is nurtured and socialized; it is the workshop in which each generation elaborates on its received tradition; and in the end, it is the legacy that each generation passes on to its descendants. As we emerge from childhood, each of us becomes part of a group tradition and each accepts the burdens of social responsibility. As we learn about these traditions, we are shaped by them; as we live these traditions, we give them new expression. Each cultural resource is a symbol: a tangible reminder of values and ideas; a spark to touch our spirits and to fire our imagination. Cultural resources provide a path by which we can discover our own humanity: the magic of birth, the mystery of death, and all the wonder of living that lies between. The cultural resources in our parks are an invitation to see our country, our neighbors, and ourselves in a new light. They are a challenge to commonplace ideas about human nature, ethnic characteristics, and national identity. They hint and tease and provoke. What makes this nation special? What are the broad patterns and singular events that shaped this country? Who were the leaders and the innovatorsthe ones who pushed back the boundaries of what could be? And what is the character of its people: the original inhabitants and those who came later from all parts of the worldpeople who differed in language, faith, custom, dress, and color? What can we learn from them? Although the primary function of cultural resource management is to preserve, protect, and conserve the material aspects of cultural resources, the primary value of those resources is to enliven, enrich, and inform. In this era of rapid and continuous change, cultural resources provide essential points of orientation and inspiration. Cultural resources help provide a setting in which cultural diversity is viable and individual potential can be realized; they help bring us together in a spirit of appreciation for the past in order to better meet the challenges of tomorrow.